If you have been following property related news recently, you may well have heard the term PropTech. And if you haven’t you’ll have heard of companies operating under the label: Airbnb, Rightmove, Zoopla, Nest and Splittable for example. PropTech is a buzzword gaining currency in media, tech and property circles. It refers to the wave of companies using technology to refine, improve or reinvent the services we rely on in the property industry to buy, rent, sell, build, heat or manage residential and commercial property. 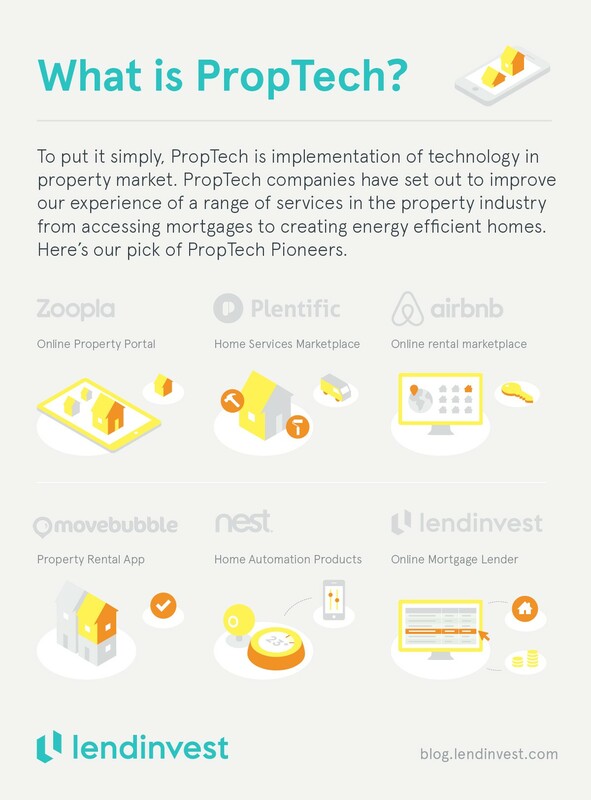 Just as FinTech companies aim to improve financial services for customers, PropTech companies have set out to improve our experience of a range of services in the property industry from accessing mortgages to creating energy efficient homes. The emergence of PropTech has already begun to disrupt the property market and over time should change the way people perceive their interactions with the property market. For example applying for a mortgage is rated as one of the poorest customer experiences you can expect in financial services — it’s LendInvest’s goal to change that for good. To a large extent we all still rely on the age-old infrastructure of the property industry. But with the advent of PropTech, new businesses with an enhanced emphasis on customer experience and customer service are offering more convenient, efficient alternatives to out-of-date processes we’ve learned to put up with. Whether you’re looking to invest in a property or hunting for your next rental flat, chances are you’ll stumble upon some websites or apps to help you with your search. You might discover you can diversify your property investments online across the country, or break into the property market investment game without huge up-front costs. Or perhaps you’ll bump into a way to take the stress out of renting — or get access to land as you launch a property development business. The emerging PropTech landscape really is an exciting place. Explore it! We suggest you look at ‘Who to follow on Twitter to keep apace with PropTech’ as a first port of call. Airbnb: Airbnb, a PropTech giant, is an online marketplace that enables people to list, find and rent homes for holiday and short-term rental. From New York to New Delhi, you can book a room online anywhere you go. Nest: Nest is a leader in home automation products, including Wi-Fi-enabled thermostats, smoke detectors, and other security systems. It is now a part of Google’s parent company Alphabet Inc.
Zoopla: Zoopla is a leading property portal and online agent. It’s also a big backer of the PropTech sector having partnered with four PropTech start-ups: Trussle, an online mortgage adviser; Landbay, a peer-to-peer mortgage provider; Property Detective, which provides data and reports on neighbourhoods; and FixFlo, a platform for requesting repairs in rented properties. Movebubble: Movebubble is a property rental app that helps renters find a property easily in London. The app enables people to view property, book viewings all through the app, in just a couple of taps. Plentific: It is a marketplace to find a tradesmen or home service professional. Whether you’re looking for a boiler engineer to fix your boiler or electrician to install a new light, Plentific can make your life easier. LendInvest: They are the UK’s leading online platform for property lending and investing. You can invest in secured loans made to property entrepreneurs through the LendInvest online platform.